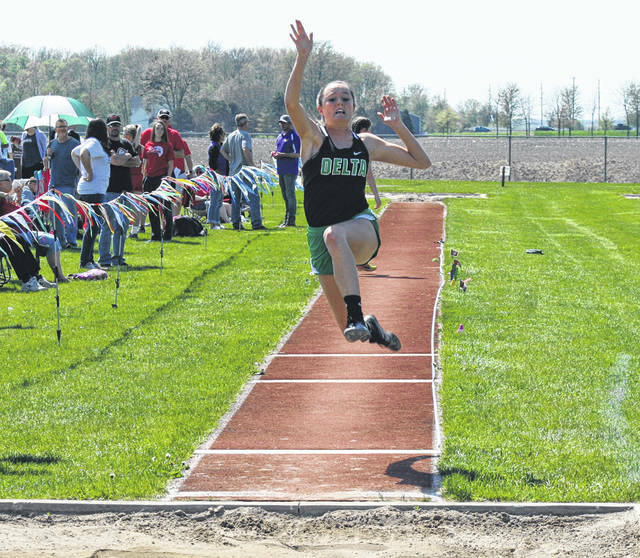 Cassandra Lee of Delta competes in the long jump during the NWOAL Track and Field Championships last May. She returns for her senior season. With only four letter winners absent from last year’s team, Delta track and field has a decent shot at improving its league standing in 2019. The Panthers placed seventh in both the boys and girls meets at the 2018 Northwest Ohio Athletic League Championships. Notable returnees for the Delta boys are Hunter Tresnan-Reighard, who was a regional qualifier in the shot put and placed eighth at state in the discus, and Nate Kohlhofer, who was also a regional qualifier in the shot put. They return Nick Sherick, Walker Sniegowski, Kai Fox, Blake Schauwecker, Darren Dunning, and Kaleb Barnes. The girls get back a trio of regional qualifiers. Cassandra Lee made it in both the 100 and 300 meter hurdles, Brooklyn Wymer in the long jump, and Ella Ford in the high jump. Also back are Braelyn Wymer, Sydney Schauwecker, Mindy O’Neill, Jenna Hallett, Brooklyn Green, and Keirsten Culler. Collectively, the Panthers will have to replace the quartet of Hallie Weishampel, Courtney Riches, Jarren Heinemann, and Atreyo O’Neal. “Our throws and sprints will be a strength for our boys. Our girls (strengths) will be our jumps and hurdle events. The girls also, show promise in the sprints,” said coach Reighard of her team. On the boys side, Delta is adding newcomers Dakota Davis, Shawn Cook, and Austin Kohlhofer. Izzy Wyse, Anna Munger, and Gabby Ford are newcomers for the girls. “We are young, it will be crucial for us to be able to develop our younger athletes mentally so they can utilize their talents when going against older more experienced competitors,” said Reighard concerning a weakness for her squad. Delta begins the season Saturday, April 6, at the Eisenhart Invitational at Tinora.